This guest blog post is based on a current QR code project to help students with referencing. Nic Howorth and Sarah Munks are Subject Librarians at the University of Huddersfield. Sarah is based at the Barnsley campus and has responsibility for Art, Design and Architecture and Music subject areas. Nic looks after the School of Education and Professional Development. Both regularly deliver information skills sessions to students and staff. 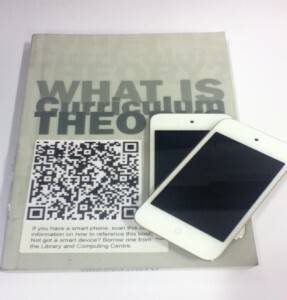 To make use of QR code and mobile technology to provide in-hand, timely, text specific referencing advice for students. The project is based at our campus library in Barnsley and is investigating the willingness of students’ use of mobile and QR code technology to access learning support. Recent research has suggested that the rise in use of mobile technology is resulting in more and more learning taking place outside the traditional classroom or lecture theatre (Solvberg & Rismark, 2012) and the increase in and availability of mobile devices and developments in technology (smartphones, tablets, portable music players etc) allow users to readily and easily access the internet or download applications (Walsh, 2012). Students want more choice with regards to when and how they learn and increasingly want to be able to use their own mobile device to access teaching and learning materials. Using QR Codes is an ideal way of utilising user owned mobile technology to engage and support learners. As a result a short survey was conducted at the campus and revealed 66% of respondents owned a smart phone, and 68% of these students would use it to access help with referencing which started the project. Two courses were identified within the School of Education and Professional Development but with a different demographic of students for each course. The project hopes to identify if students on a particular course and part of a particular demographic were more or less likely to use mobile technology to access learning support. A reading list from a PGCE in-service module and Early Years BA (Hons) module were utilised and a blog entry for each title on the reading lists was created. The blog entry advises students how to produce an in-text citation and reference using our institutions Harvard referencing guide. QR codes were then produced linking to each of the blog entries and attached to each text on the reading lists with text advising students what the code was for. A decision was made early on to promote the QR codes to one group of students and leave the other to their own devices with a view of seeing if promotional activities make a difference with regards to usage. During December we promoted the QR codes in referencing sessions delivered to the PGCE cohort. During March we ran an exit survey to gauge the level of awareness of QR technology amongst our student population. The results are being reviewed. The project is still on-going and the next steps are to arrange focus groups with students to gain qualitative feedback. In particular the usefulness of delivering advice/support using QR codes and mobile technology, the analytics of hits/views to the blog posts will also be reviewed. We used the free Kaywa QR code generator as this allowed us to produce and save multiple QR codes. We have since discovered Power QR which allows you to produce a QR code then change what it links to remotely without having to re-produce or re-print additional codes. This wouldn’t have worked for our referencing project but would be ideal if you’re thinking of using QR codes as promotional tools (i.e. you could link to a different site/resource each week using the same QR code). As the referencing information was probably going to be viewed using a mobile device we used WordPress to create our blog as their blogs are optimized for viewing on a mobile device. Where possible, we included an image of the book cover for each blog post to make it more visual – see the Mobile Referencing blog for examples. Solvberg, A., and Rismark, M. (2012) ‘Learning spaces in mobile learning environments’. Active Learning in Higher Education. 13 (1), pp.23-33. Walsh, A. (2012) Using mobile technology to deliver library services: A handbook. London: Facet. This entry was posted in Guest blog posts and tagged nic howorth, qr codes, referencing, sarah munks on May 17, 2013 by Jo Alcock.